In addition to history, you get great covers. 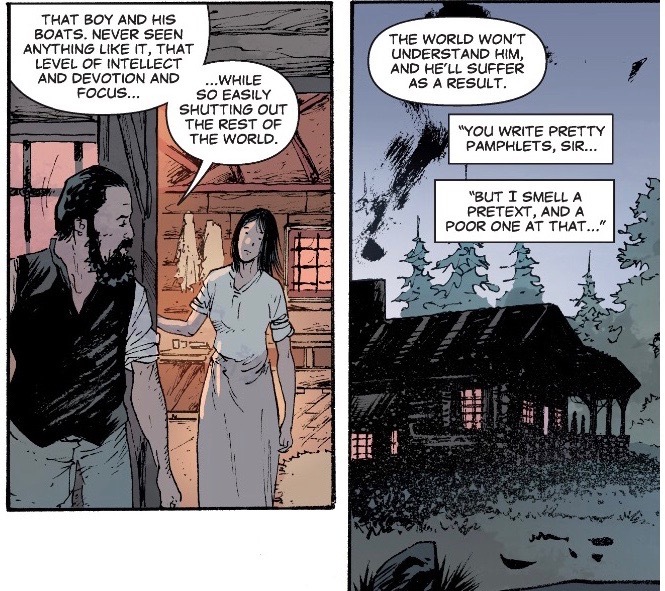 Brian Wood is no stranger to history. His Northlanders series for Vertigo presaged the Viking fad by five years. 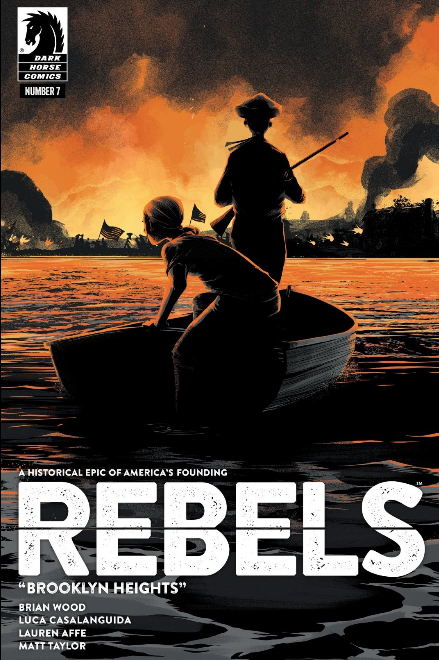 He followed that up with a Revolutionary War title for Dark Horse, Rebels. 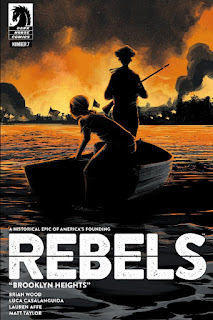 Wood, artist Andrea Mutti, and Dark Horse apparently couldn't stay away from that time period, because they've released a sequel series, Rebels: These Free and Independent States. R:TFAIS implements an anthology format familiar from Wood's previous historical fiction series: a collection of stories, some single issue, some multi-issue arcs, with each new story jumping to a different place and specific time within the historical period the series addresses. Characters and specific situations are wholesale manufactured for the series but set in real locations among real historical events (with guest appearances by real-life historical figures). Stories typically touch upon at least some aspect or issue of modern life, but in the context of these historical times. Such a rosy view of autism. The title starts with a multi-issue arc that both establishes these patterns for the new ongoing series and ties back to Wood and Mutti's prior Rebels series. Set during the time the US established its Navy to fight in the Quasi War with France as well as the two Barbary Wars, the story stars John Abbott, son of Seth Abbott, star of the first arc of the previous series. Seth, a creation of fiction, fought with Ethan Allen as a member of Allen's Green Mountain Boys. This series picks up with the growing John finding his way into the world. John is clearly meant to be somewhere on the autism spectrum, but is a savant when it comes to ship design and building. Unable to establish a bond with his son, Seth brings John to the Boston shipyards to apprentice there and prepare him for adulthood. It is there that John intersects with one of the great stories of US history, the famed warship USS Constitution. The real objective of Revolution: the right to cut down trees. R:TFAIS makes John Abbott the designer of Constitution, and the insertion of both he and John's boss, Mr. Nicholson, into the story takes away the roles that the true designer (Joshua Humphreys) and builder (Edmund Hartt) played in the actual ship. But that won't have much impact on the typical reader, who will be more interested in Wood's character work, which has always been his strength. In John, Wood has a protagonist that approaches his work with a fervent, single-minded focus that serves as the source of both triumph and tragedy. It is a common story throughout modern history, from Tesla to Robert Kearns, and in John the reader can find traces of each inventor. 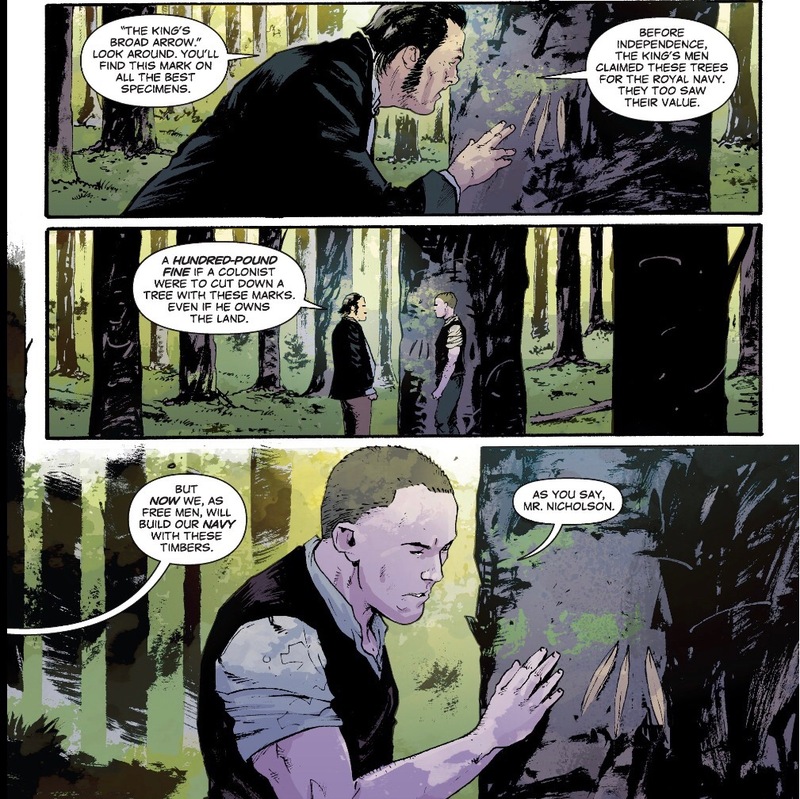 However, his cognitive and behavioral aspects that are particular to his condition are only really explored only from a distance, a tendency Brian Wood repeats in subsequent stories. Mount Vernon gold and Mount Vernon slaves. 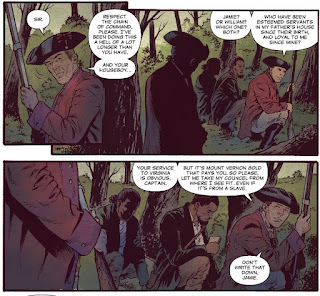 The series' second story, "The Virginian", follows George Washington in action leading up to the French and Indian War in battle at the fictitious Fort Rectitude. "The Virginian" paints Washington as an ambitious man wishing to bring prestige to his home colony of Virginia and his home at Mount Vernon in particular. Perhaps most interesting, though, is his reliance on a pair of personal slaves as his command staff. Washington's subordinates question it, as do his superiors. Washington thinks nothing of it, as he trusts these men, though not enough to free them. Unfortunately, we don't get to see things from the slaves' perspectives. While slavery was an important aspect of the realities of our founding fathers and a topic addressed in this story, the slaves themselves do not take agency in the story as they are instead just talked about by others, more object than actor. She was too tough to actually star in the story. 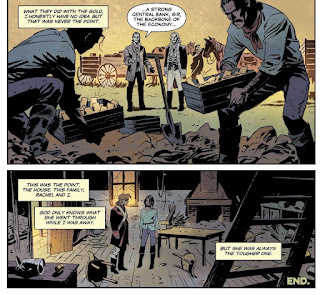 That tendency traces directly into the next story, "Brooklyn Heights", in which a brother and sister weather the Revolutionary War and find gold that can start the new nation's economy. 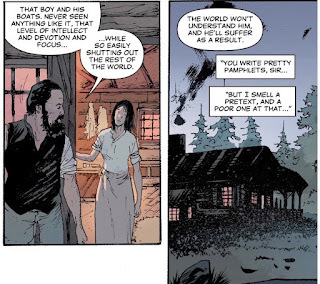 The brother, Charlie, is the point of view character for the issue, and he spends much of the time talking about how his sister, Rachel, is the strong one. But we don't actually get to see Rachel's strength in action, as the issue follows Charlie and sees things through his eyes. We see evidence of her strength, but are not shown it directly. In that sense, Rachel is a guest star in her own story. This is not to say that the stories told so far in Rebels: These Free and Independent States aren't interesting or compelling. The series features Wood's typical strong character work and Mutti's appropriately spartan linework. The historical times and themes explored are interesting. I just wish that the stories embraced their diverse cast members rather than holding them as subjects to study at a distance.